I know some people never make the same quilt pattern twice, but I'm not one of those people! 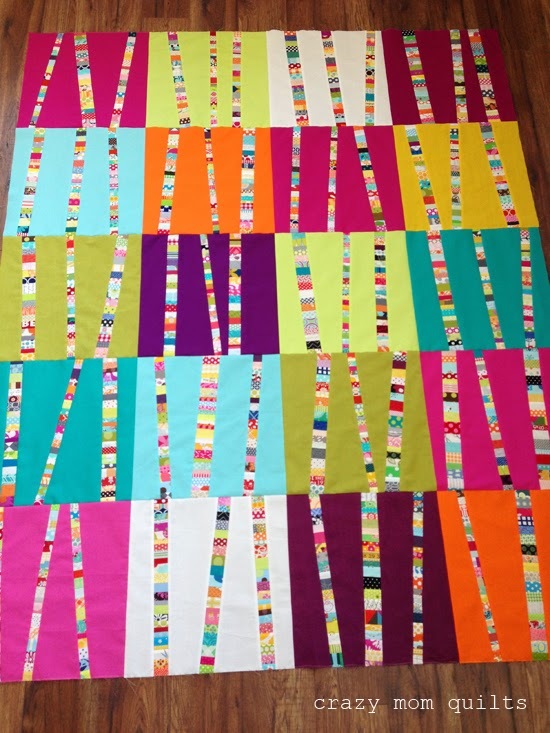 This is my second bright birch trees quilt, and this one will be going to a friend of mine. I decided to go with nearly the same color scheme as the first version. 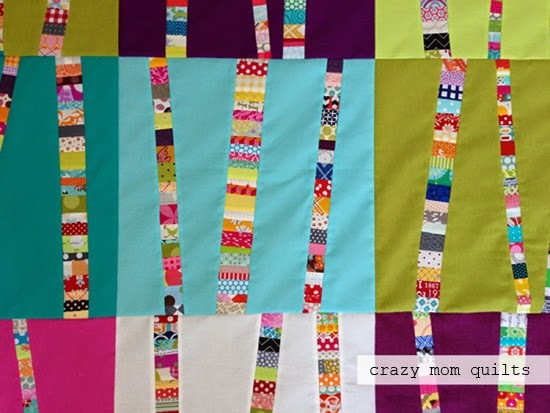 I love how the scrappy strips are set in the bright, bold background colors (and white). 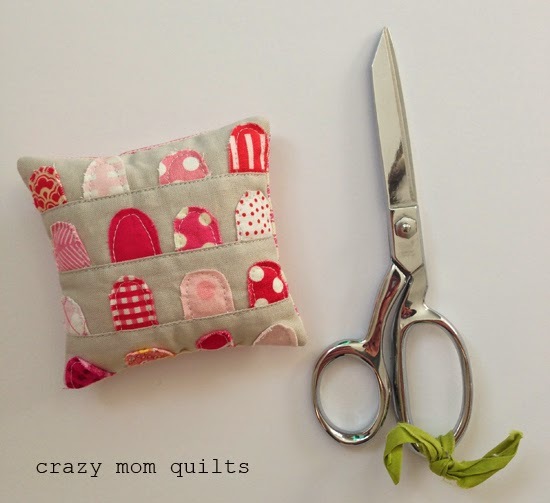 This pattern is my very favorite way to use up tiny scraps....because you KNOW that I just can't bear to throw them away. I've been working on this one off and on since last November. I'm happy to have it in quilt top form. One step closer to a finish! And of course, happy Monday to you! My Gruber's retreat friends and I are doing a quilting bee this year. It's been a few years since I've been a part of a bee and I'm excited to be a part of this one. It's funny, one block per month doesn't seem like that much of a commitment, but the months fly by. (A sure sign that I'm getting old. ha!) February seemed to go especially quick! This block is for Cindy. She requested a bright colored Dresden block with a black and white center. She will be attaching the blocks to a background, so even if it doesn't LOOK like it's finished, it sure is! This was the first full sized Dresden block I've made. It was fun, but appliqueing the center was tricky since there was very little fabric to attach the circle to for basting purposes. One and a half tries later, the center is attached. Yay! So, a small finish, but a finish nonetheless. I'll take it! I'm not a big fan of making hand made bags, but I do love carrying them. Every once in awhile I make one anyway, even if the process isn't my favorite. The results are totally worth it! Over the past several days I sewed up this messenger bag. I didn't follow a pattern at all, but I did consult my friend Tara on a few parts of the construction. (Thanks Tara!) 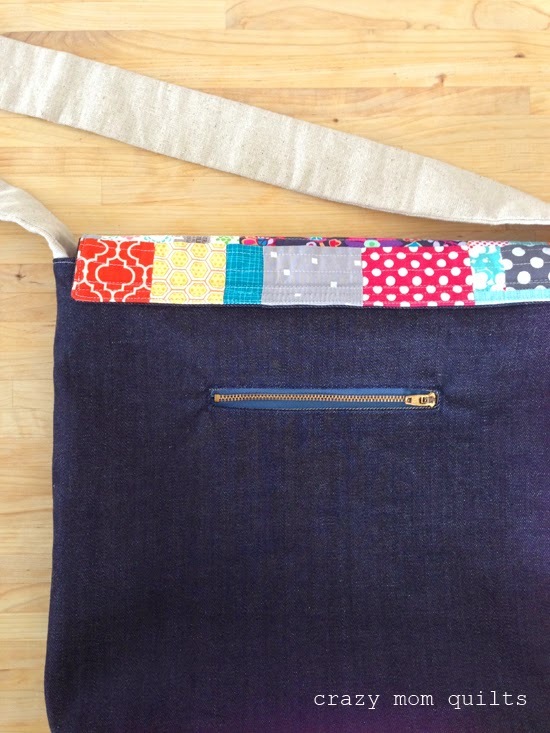 The outside is made from denim, the flap is scrappy, of course! I used a linen strap that I found in the epic bag of scraps that I received from Mary. It was so nice to have that part done! ...and I even added a zipper pocket to the back of the bag. 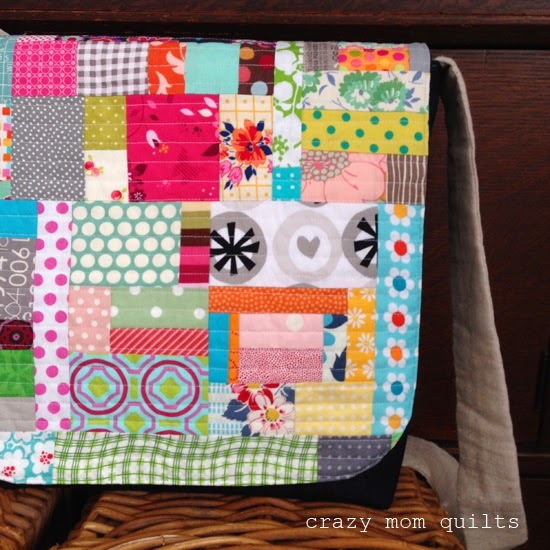 I watched the instructions on how to make a zippered pocket in Tara's Quilt as You Go Patchwork Bags Craftsy class, which completely demystified the process. I felt so smart and accomplished! It's not perfectly straight, but not bad at all for a first try. 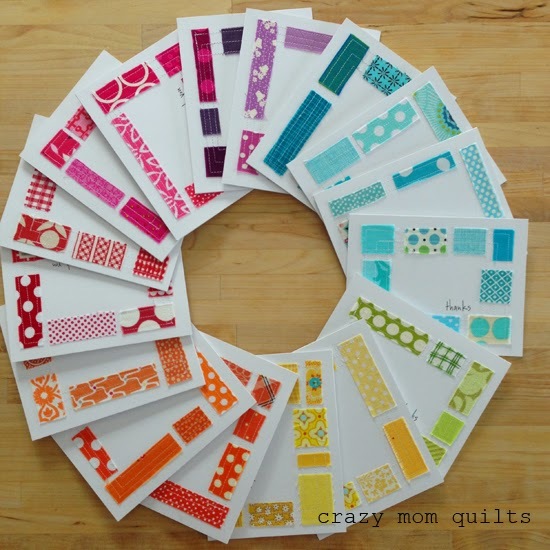 I haven't said it in awhile, but...hurray for scraps!!! On an unrelated note...I apologize to those of you who follow my blog via email who received a weird email message linking to me last week. My blog got hacked (what a mess) and I apologize for the trouble. Please delete the email message and move on. Hopefully it's all taken care of now. Thank you to those of you who gave me a heads up. I appreciate it! Apparently zippers have been the theme the past few months at my place! I made another baggy pouch, this time in size large. Pattern is by Aneela Hooey. It's a fun one! 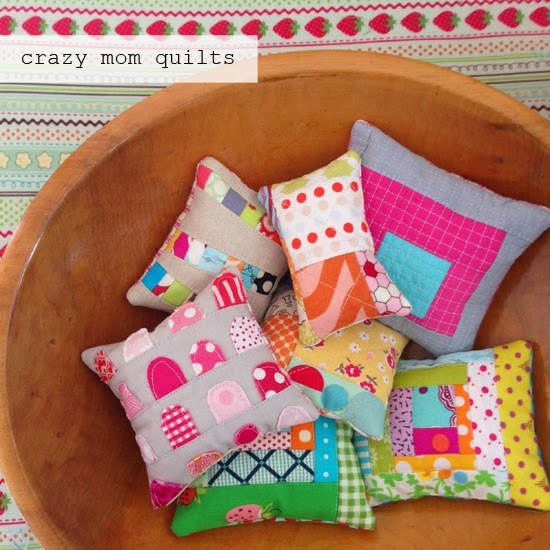 I love making it with patchwork. I used mini charms from V and Co. (Color Theory) and Kate Spain (Paradiso). The two lines work SO well together. I'm pleased that I was able to use the mini charm packs and not hoard them until the end of time. That's a big WIN for me! I LOVE this pouch!!! 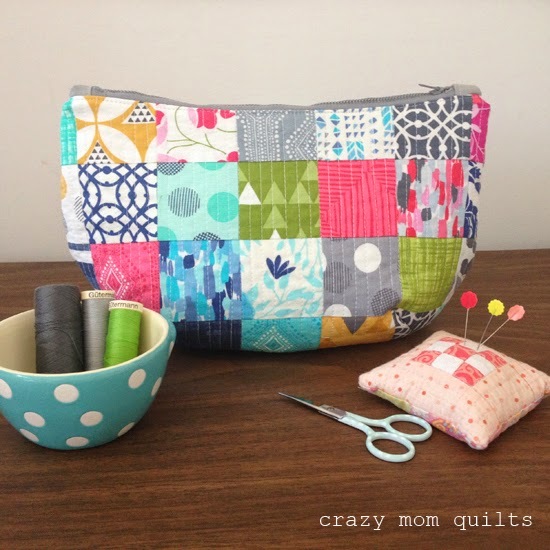 Last Sunday I taught a few new friends how to make simple zipper pouches. We were going to make the pouches out of a single fabric exterior, but patchwork is always cuter, so we went that route. More 2 1/2" squares, except we used scraps this time. 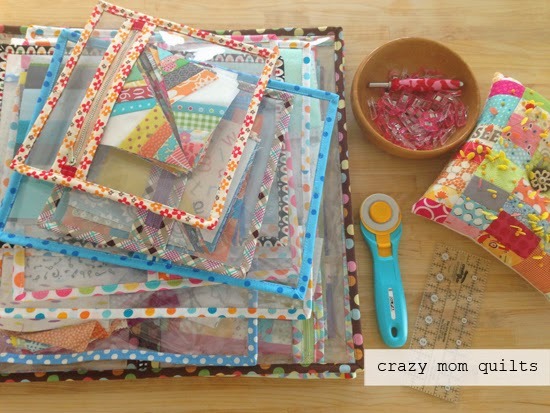 (Yay scraps!) I love how they turned out! One woman had never sewn before...I think she is going to be hooked. Of course, finishing my pattern was the biggest finish of all this week. Many, many thanks to those of you who purchased a copy! I appreciate your support! I decided to pick 5 winners for the giveaway. They are: Cathy, Cathy L, Susie at ProspertyStuff, Elizabeth Peterson and Aliceart. Thanks to all of you who entered. Now, at last, it's your turn. Please link up your finishes for the week. Thanks for finishing with me. Happy Friday! When developing the pattern for my Work In Progress bags, I tested at least 7 different kinds of vinyl! I bought 3 at JoAnn's, 3 different ones at Wal-Mart and I also used two that I had on hand. Ok, so maybe 8 different kinds. Here in the US (I'm not sure about other countries) vinyl is sold by the yard and it comes on 54" wide roll. Vinyl comes in different weights, ranging from 4 gauge (the very lightest I found, which is the thickness of a really cheap shower curtain) to 20 gauge (which is pretty thick). I tested 8 gauge vinyl for the pattern and I found it to be a little bit wimpy. It could work in a pinch, but it was too thin for my tastes. I tried 12 and 16 gauge vinyl and those both worked beautifully! There is a little bit of heft to it, but not overly thick and pretty easy to sew through. 12 or 16 gauge is what I recommend for the pattern. Easy to use, but sturdy enough to hold up over repeated use. I also made at least one bag with 20 gauge vinyl, which worked, but that stuff is pretty thick! After making several WIP bags, the thickness didn't phase me, but if you are just starting out, it might be a little intimidating. I purchased vinyl at JoAnn's and at my store it ranged in price from $4.99-$8.99/yard. My local Wal-Mart also carries vinyl on the roll (sometimes referred to as clear table covering) in the craft section, but they don't specify the gauge anywhere on their product. (Because why would it be that easy, right?) I tried 3 of their products, Heavy Weight Clear, Clear Vinyl Premium and Super Weight Clear. If I had to guess, I would say that they would be 12, 16 and 20 gauge respectively. That's just a guess! All of them worked well for the pattern. At my store, the prices ranged from $2.97-$4.77, which is significantly cheaper than JoAnn's and no coupons needed! But, finding someone to cut it might be a little tricky. I had some vinyl on hand that I used as well. It had been rolled up, folded up and shoved in the back of a closet for a few years. It was kind of a mess and it was creased in some areas. I cut around the most significant creases. For the less significant creases, I found that if you place a piece of fabric over the vinyl, a warm iron can release/relax some of the kinks. I would be cautious in doing this, because you don't want to melt the vinyl (and ruin your iron), but it does help. I would start with a warm iron and increase the temperature gradually, as needed. Just be careful! When purchasing and storing vinyl, be cautious not to crease or smash it. Also, don't roll it up too tightly into a tube, or it will retain it's curl and it is harder to use. A little experience talking! Sewing with vinyl isn’t difficult, but it takes a bit of getting used to. Don’t expect perfection right out of the gate! Be sure to sew slowly and take your time. That really does help! 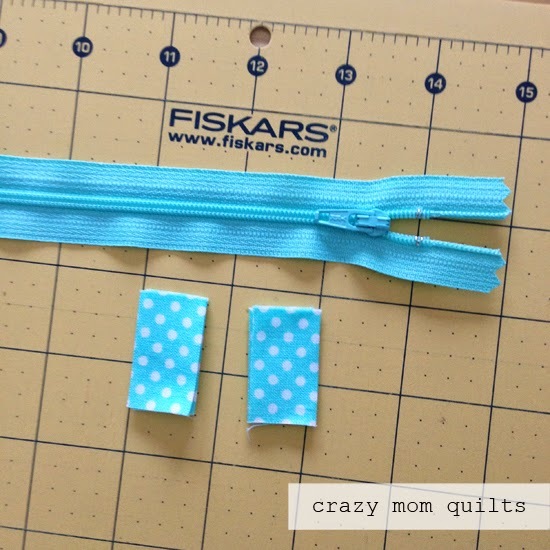 You can't pin through vinyl (without leaving holes) so Clover wonder clips are essential. They hold the layers in place while you sew. I used a standard piecing foot on my sewing machine--even when attaching the zipper to the vinyl. 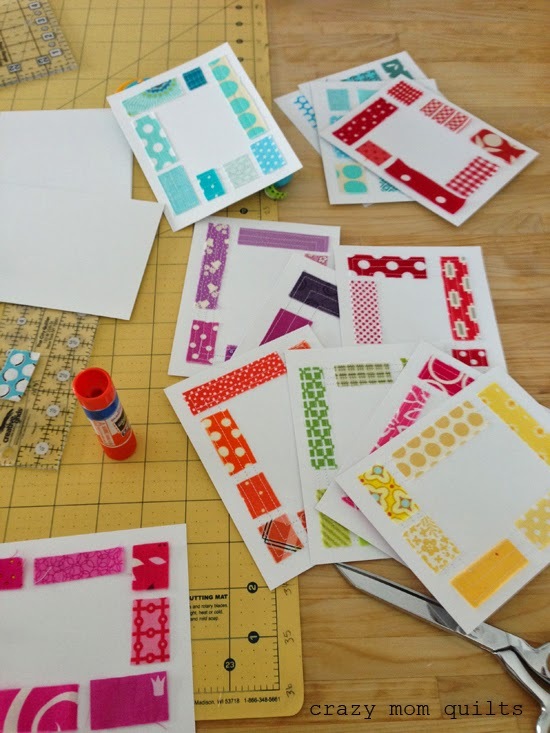 If the vinyl sticks to the sole plate of your machine, you can place a piece of tissue paper under the vinyl and it will allow the piece to move through your machine easily. Sometimes the first few stitches are sticky, so I just nudge it along to get it moving and usually it's smooth sailing from there. I used a Universal 80/12 sewing machine needle. I've heard that a Teflon foot helps, but I have never tried one. If you have, I'd love to hear if you think it was beneficial. Now, a few things about zippers. I feel like I'm writing a book report. Hahaha! Did you know that a zipper is always measured from end stop to end stop? (Not from one end of the zipper tape to the other.) I didn't know that until last week. 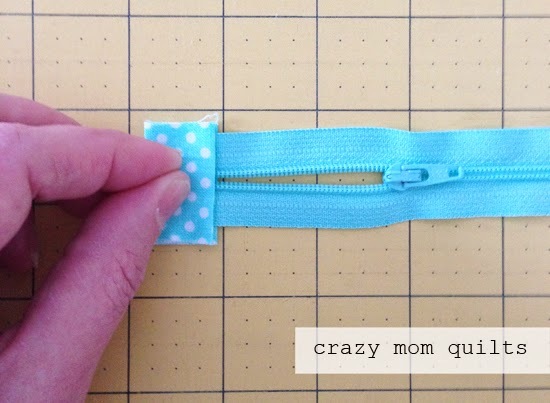 There is a whole diagram here about how to measure a zipper that is pretty interesting. 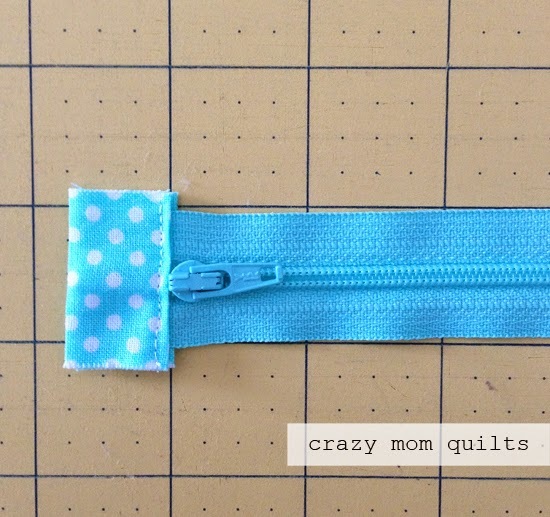 My local quilt shop sells zippers for $1.10 (which is a good price) and they come in so many fun colors. They only carry one size (14"), but since they have vinyl teeth, they are easily shortened. 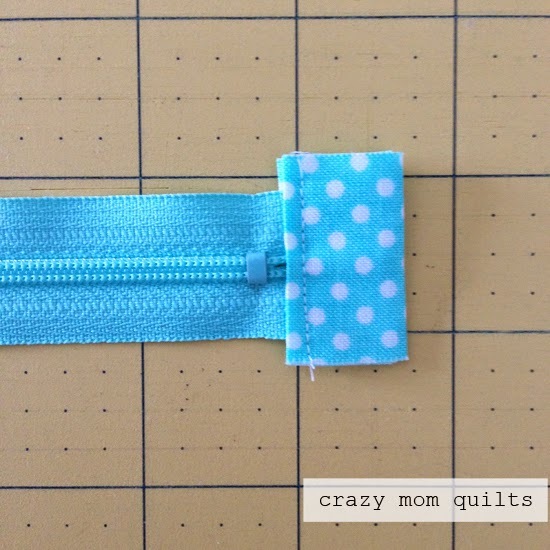 I thought it would be beneficial to share how to shorten a zipper. As always, this is just one way to do it! Slip one of the zipper tabs over the end with the metal stop and sew in place. Don't encase the metal stop inside the fabric tab. Mark the length that you want your zipper to be. In this case, I want my zipper, with tabs, to be 13 3/4", so I made marks at 13 3/4". A sharpie works great for this step. Cut on the markings. Be careful NOT to slide the zipper right off the end! 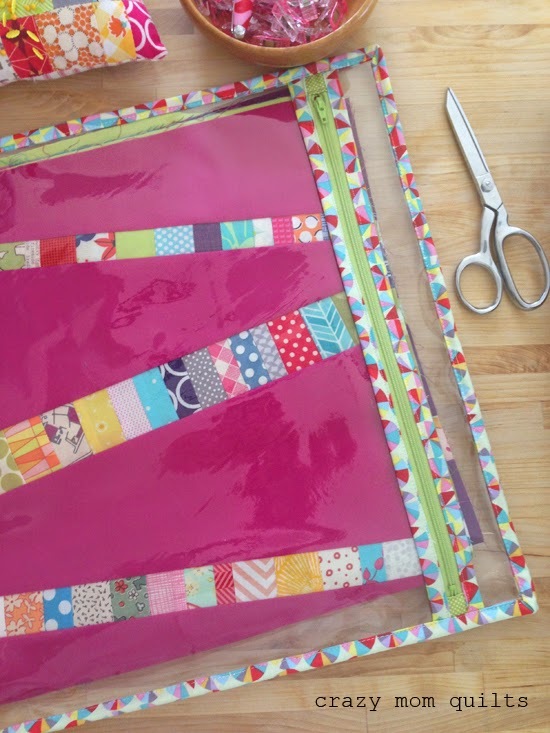 Place the remaining fabric tab over the zipper ends so they are fully enclosed. 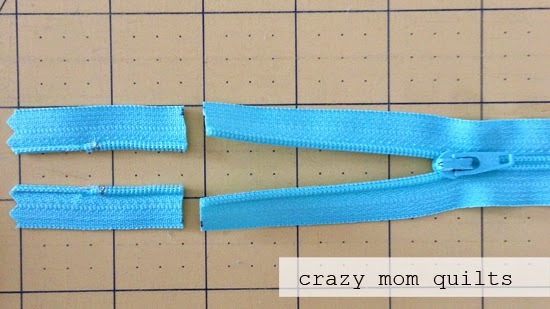 Pinch the two parts of the zipper tape together. Carefully take the piece to your machine and sew it in place. It's a little tricky! As you can see, the tab isn't placed exactly 90 degrees on my zipper. But really, it's ok! Once the zipper is installed, you won't even notice. 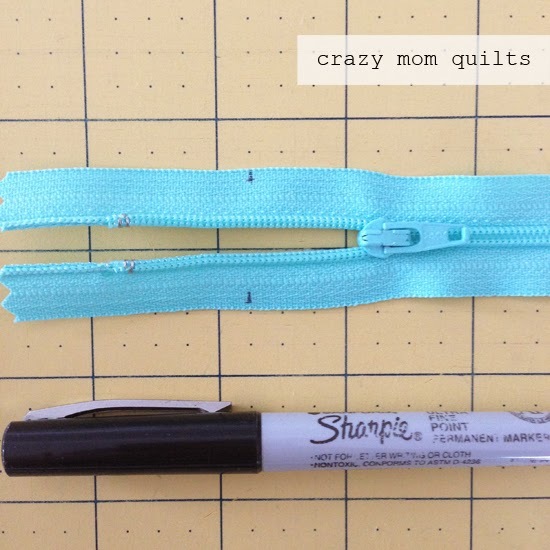 The overall measurement of the zipper, with tabs, is about 13 3/4". That's it! Ok, that is a LOT of information in one blog post! I hope that it helps clear up any questions you may have. If I missed anything, please ask and I will try to answer in the comments. Someday I am going to write a blog post about how hard pattern writing is. Today, I am going to celebrate the fact that I finished another one! 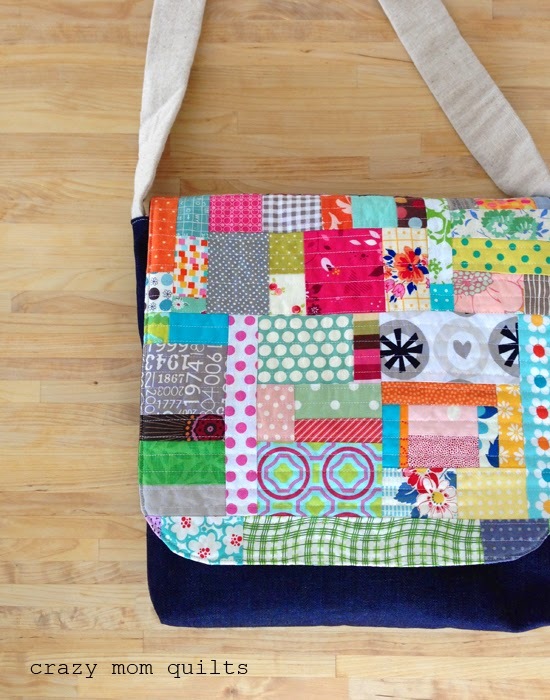 The Work In Progress bag pattern is complete (YAY!!!) and it is available for purchase here. Phew! I was inspired to make these bags after seeing a few different WIP bags around, coupled with the fact that I needed a decent way to keep my collection of 22 WIPs organized. The design for the bag is my own and it is something that I worked out through a lot of trial and error. (It took me 5 tries just to get the zipper install worked out!) I'm very pleased with the results and I LOVE how uniform my WIPs are now. Vinyl isn't scary to use at all, and I love that you can easily view the contents without opening the bag. I've made 17 of these babies so far! I may have been a little zealous in my pattern development. Hahaha! Only a few more to go and all my WIPs will have their own bag. But, at this point, I think it's time to finish a few quilts! I MAY have had my fill of zippers for the time being. Can you imagine? To celebrate the release of the pattern, I will be giving away 3 copies of the PDF pattern. If you would like a chance to win, please leave me a comment in this post. In your comment, I would like to hear about how many WIPs you have. (I know, that's kind of like asking a woman her age, but it's the subject of the day, so I kind of feel justified!) :) I'll pick the winners in a few days. Edited to add: the giveaway is now closed. Thanks to all of you who entered! Last Friday, after 6 months (and 5 days) of not buying fabric by the yard, I broke my fast. Very intentionally, I might add. My friend Brianne and I met at SR Harris (which is something like Disney world for a fabric junkie) and we had a little party. It was great! 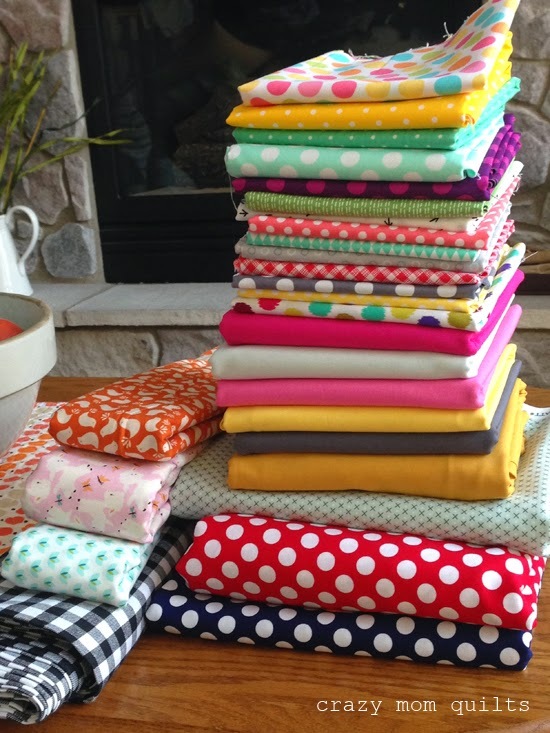 This all started last July, when my husband challenged me to go 2 months without buying fabric. I'm usually up for a personal challenge of that sort, so I agreed to it. If you think about it, 60 days is a long time to not buy fabric...especially when you sew almost every day! Well, 2 months came and went and I thought, why not go 3 months? Then 4 months. Shoot, why not try for a full 6 months? I was on a roll and it felt good! Well, about 3 days short of the 6 month mark hit, and I really, really wanted to buy fabric! (Can you imagine?) But I resisted. I'm so glad I did. It would have been silly to cave at that point. Overall, it was a good exercise in self-control. In some ways, not having the option of purchasing fabric is almost easier. It takes the decision making out of the equation and you just don't buy. The end. 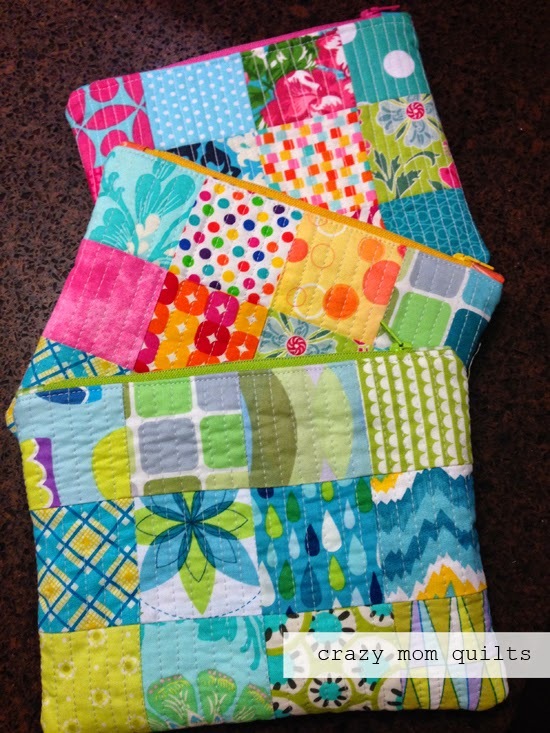 I completed 9 quilts during my fast. 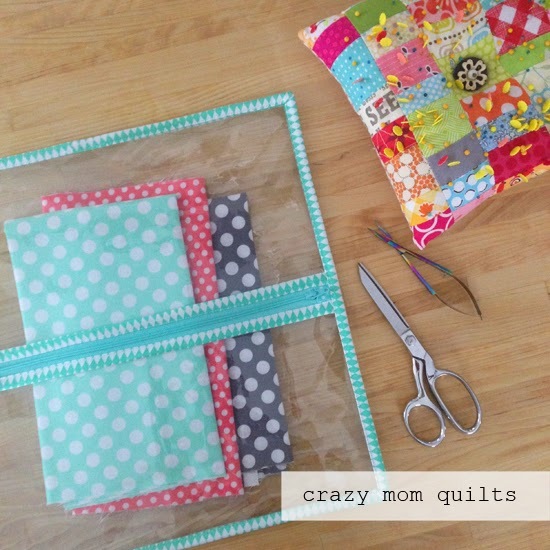 I did purchase one queen size sheet set during that time, which was used to back two quilts: Aunt Janet's memory quilt (which was the reason for the purchase) and my mustard mishap quilt. I can almost hear some of you asking, "so, why would you want to go on a fabric fast anyway?" It wasn't about the money, really. It was more about using the fabric I have while I still love it. I have fabrics that I bought a year ago that aren't even close to being close to being at the top of the queue. I love the challenge of using what I have on hand and trying to make it work. (To a point!) For example, for my plenty of pineapples quilt, I had to get creative with backing options. It took awhile to come up with the solution, but it's one of my favorite quilt backs to date! I saw a significant dent in my stash. That felt GREAT! I found that I was running low on the basics. (Light gray prints, various solids, etc.) It really helped me see what fabrics not to buy, too. (Novelty prints!) In some ways, I wish I would have used up even more of my stash...but I figured 6 months was long enough! Have you ever gone on a fabric fast or a fabric diet? I'd love to hear about your experiences, if you care to share. In keeping with all of the scrap talk this week (thanks for your lovely comments!) 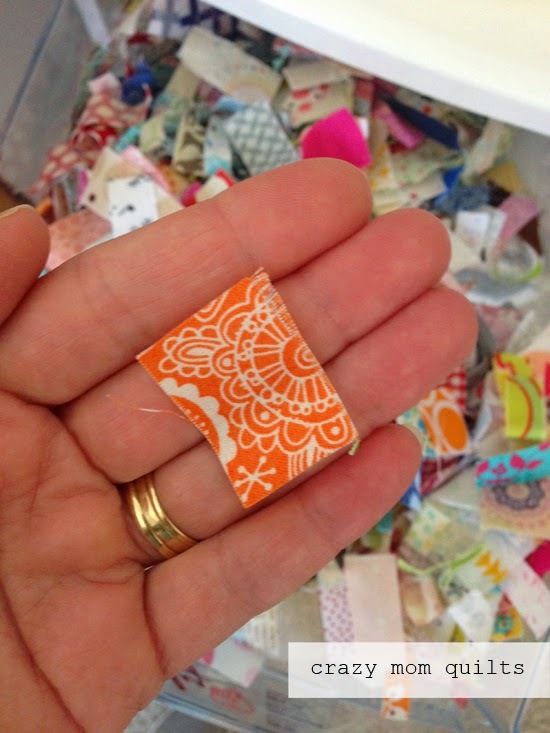 I have some projects to share today that use teeny tiny pieces. 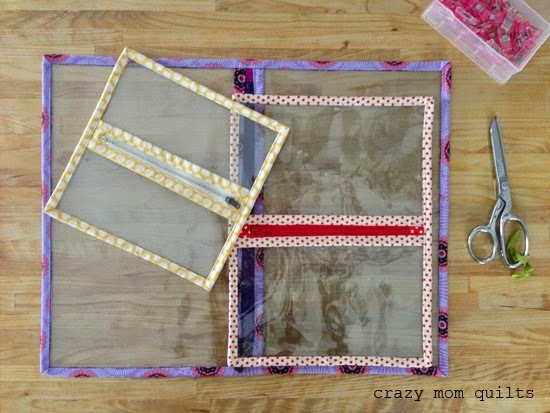 I used a glue stick to temporarily attach the pieces of fabric the card stock, then sewed around the frames a few times-in one continuous line-to permanently attach them. After sewing, I glued the panel with the fabric to a blank card, so the stitching is hidden between the layers of paper. (I hope that makes sense!) No matter how many times I do it, I always have fun sewing through paper! 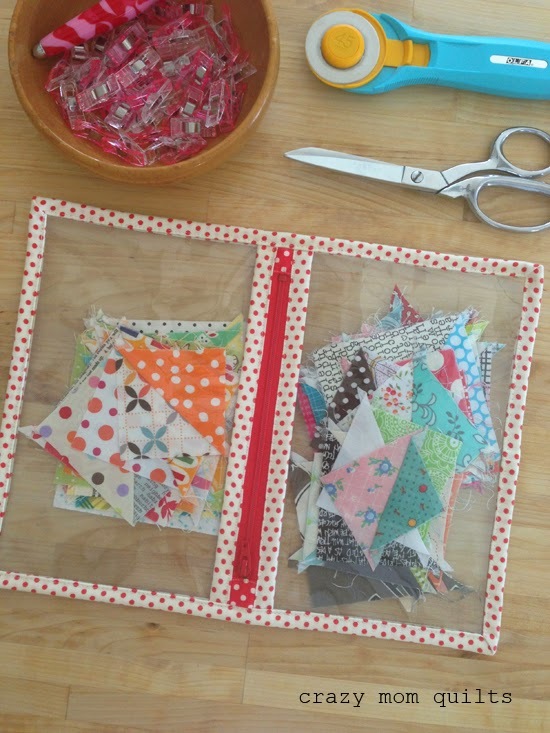 I love separating scraps (no matter the size, apparently!) by color. I had taking photos of them, too. (Wow! Two days in a row of fun photo taking sessions. What is happening?) I'm trying to figure out how I can turn this into a quilt design....of course! I used a brand new Micron pen (my favorite!) to add the words. Now, I'd better write in them and actually send them out! That's the trick. Making a tiny gumdrops pin cushion has been on my mental list for a while. You know how you always read "it's cuter in person"? Well, this time I think "it's cuter in photo". Hahaha! It's definitely not a fail, but it's just not how I pictured it. Each of the scraps are about the size of my finger nails and all I could think about was Lee Press On Nails. Ok, maybe we are getting to the root of the problem! So, only one addition to the "candy bowl" this week, but it's slowly filling. There is a lot of happy right there! Now it's your turn! Please link up your finishes for the week! Thanks, as always, for joining me for finish it up Friday! Have a great weekend! 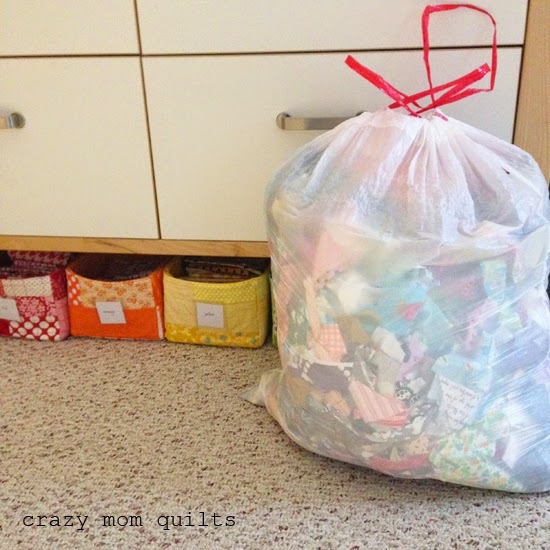 Today I'm going to talk about my scrap storage methods. I'll come right out and say that they are very extensive. 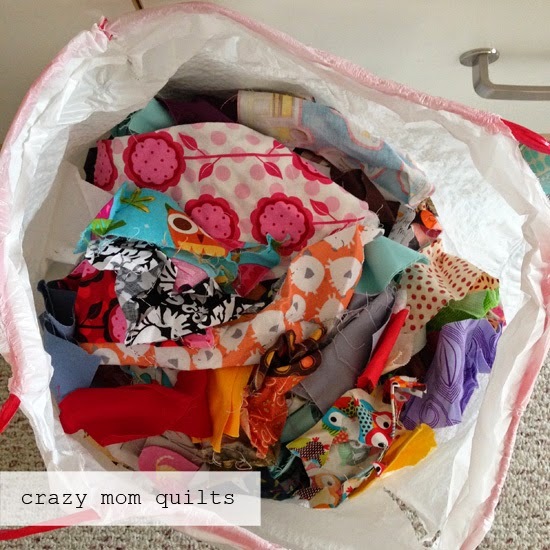 But, scrap quilts are my thing! 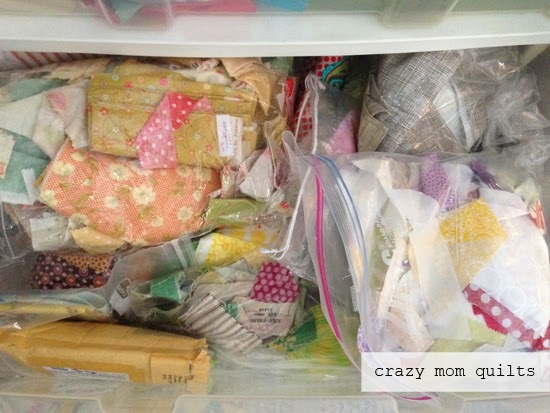 I use scraps ALL the time-even more than my stash-and having them neat and tidy is very important to me. If my organizational schemes make sense to no one but me, so be it! Having my scraps organized means I don't spend a lot of time searching for just the right piece. One more disclaimer....I have been quilting for 14 1/2 years...so it took me quite awhile to fall this deep into the rabbit hole. Ha! 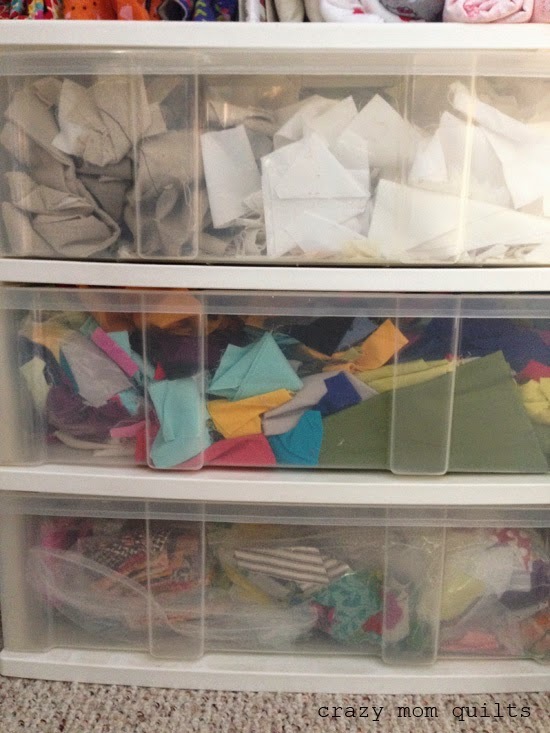 Most of my scraps are sorted by color and stored in quilted storage boxes. I LOVE these things! They are made from scraps of fabric, cardboard (from cereal boxes) and scrap batting--items you probably have on hand already. I made these 4 years ago and they have held up beautifully, even though they've been carted to more quilt guilds than I can count. The more fabric you put in them, the sturdier they are! Ha! 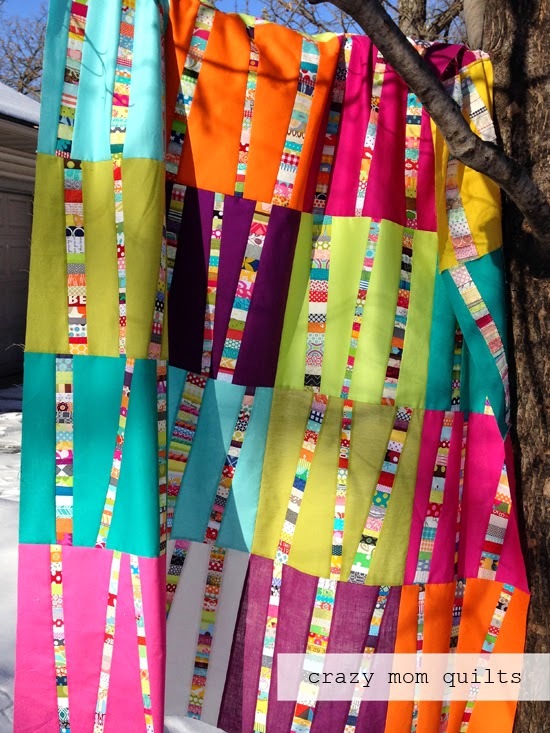 (The pattern can be found in Sunday Morning Quilts.) They aren't difficult to make, but I found it was better to make them in batches of 2, 3 or 4 at a time. I wouldn't try to make 12 in a weekend. Just a little working experience there! 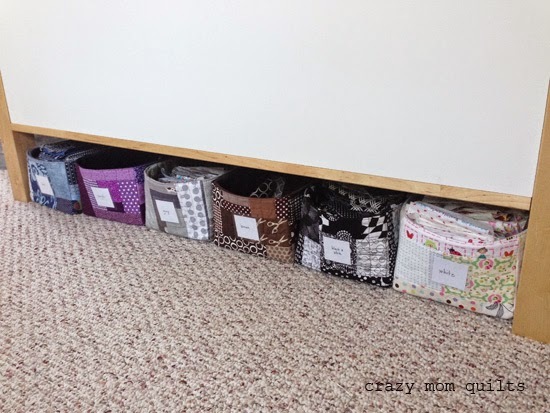 I have a quilted storage box for each color of the rainbow, plus black, brown, gray and white. 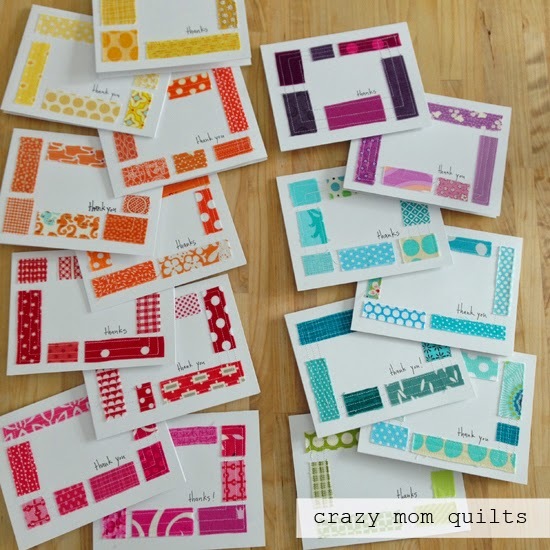 I also have one for multicolored fabrics, which is tucked between the two rows of boxes shown. I made the storage boxes years before I got my cutting table, and I felt like I won the lottery when I discovered that 6 boxes fit (like a glove) on each side. It was meant to be! They look so tidy and orderly lined up in a row. I love that! 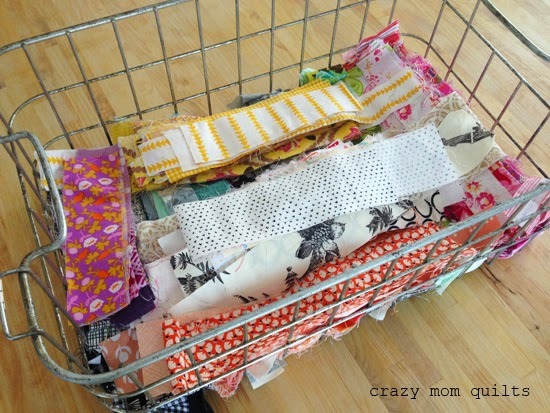 Smaller pieces of fabric are stored in this roller cart. Each drawer holds a different size of scraps: ticker tape pieces, strings, skinny strings, 2 1/2" squares, and triangles. 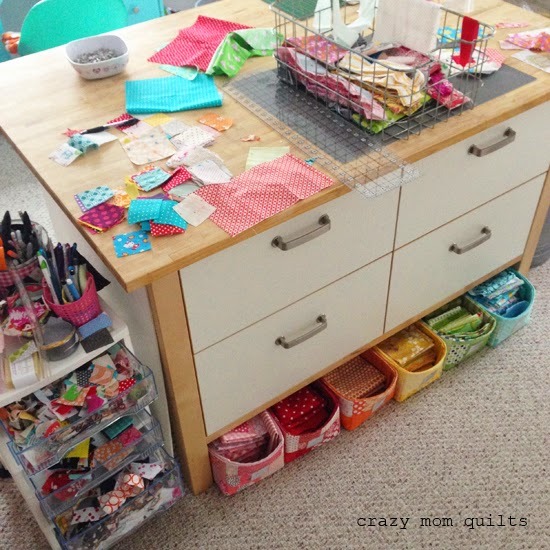 I have this near my cutting table, so I can sort scraps and put them away as I produce them. It's very helpful to sort as you go, whenever possible! The third place I keep scraps is another drawer cart. It was a roller cart at one point, but I think the weight of the scraps was just too much for the poor wheels. Doh! 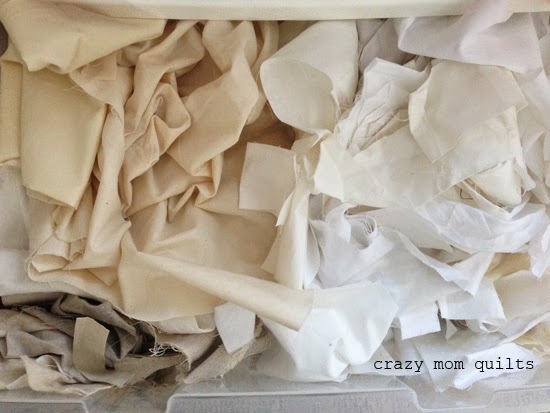 The top drawer holds solids or nearly solids--whites/neutrals/light grays/linen scraps, and the like. The second drawer holds solid scraps. I had them (kind of) sorted by warm and cool, but that line got blurred. Eventually I will need a drawer for each. Having the solid scraps separated out from my print fabrics is a relatively new thing for me and I really like it! Solids, when stored together, are endlessly inspiring to me--and that's the point! 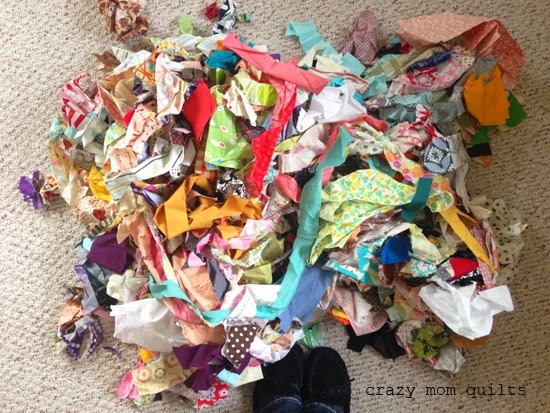 If your scraps inspire you, then you will actually use them. This drawer is FULL, so much so that it's difficult to shut. 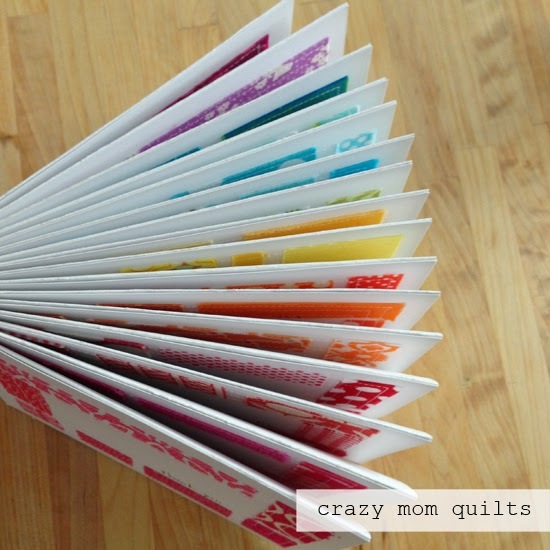 I expect to dive into an all solids quilt project before the week is through. The bottom drawer is my drawer of shame. If you watch Friends, this is like Monica's closet. (Ha!) If I have a scrap combination that is inspiring to me, I bag it up and put them in this drawer. I don't know if/when I will get to them all, but really, that's ok. If the bundle becomes un-inspiring to me, I can always sort those scraps back out among the others. That has happened once, maybe twice. I have a few other places that I store scraps. These don't have a permanent home, so they float around the craft room as needed. My bowl of selvages/super skinny strings, which I use to knit or crochet rag rugs. I have a basket of strings sorted by color. This category is redundant, but I think it's because out of all the scraps, I have the hardest time keeping up with these. 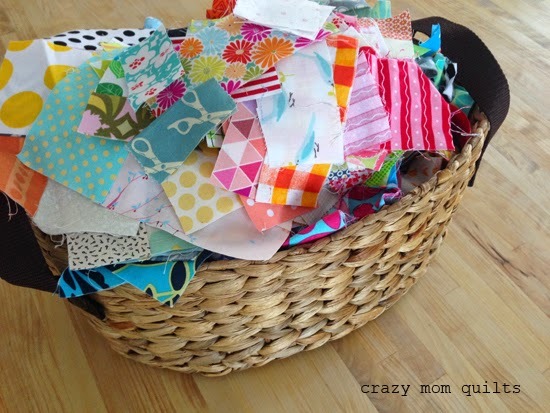 And then, I have a basket of multi-colored scraps. 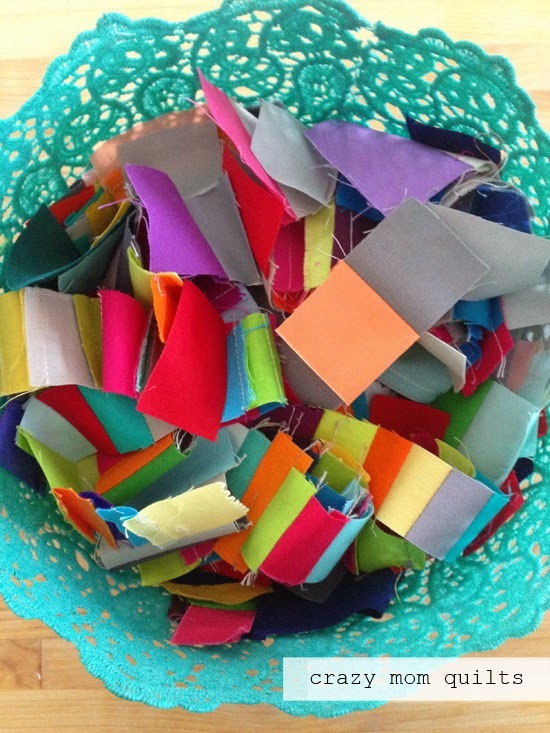 These are smaller chunks of fabric that would just clutter up my color boxes, but they are too big to put in my ticker tape drawer, so they get their own basket. 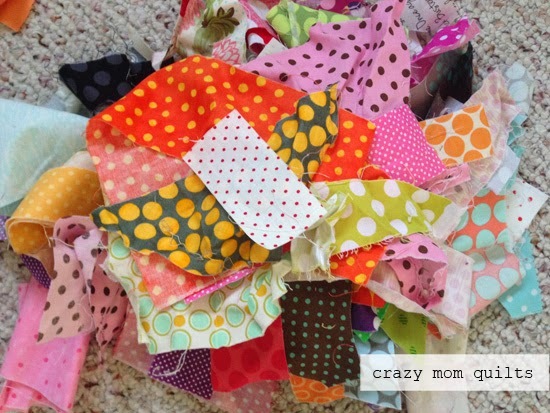 They are used mainly for improv piecing....going into quilts like scrap vortex and the family couch time quilt. So, there you have it! A complete look into my crazy scrap methods. 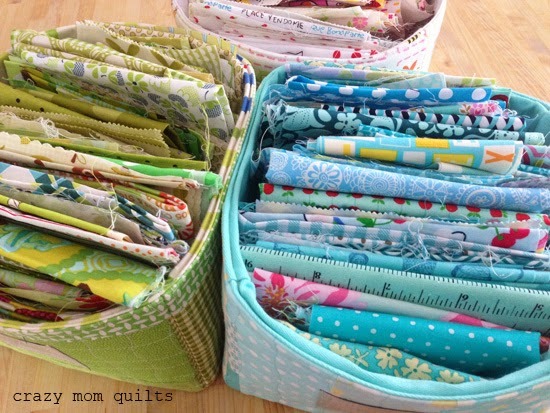 I feel the need to point out that my scrap storage methods parallel my quilting habits. I add and subtract (mostly add) categories as needed. 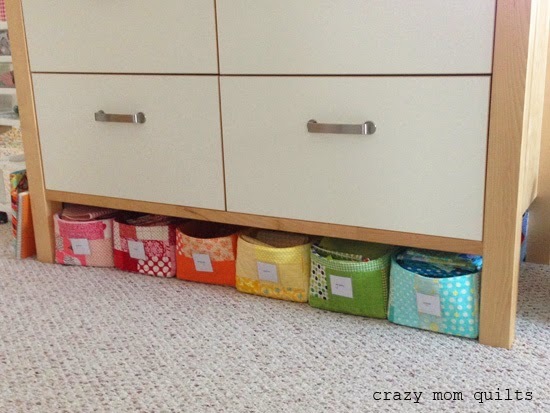 I hope that this inspires you to get organized, find a scrap storage method that works for you and within your space constraints, because it really can make all the difference. How small of a scrap do you save? The answer is...tiny. BUT!!! I have been working on a fun project to use these little bits. I plan to share it soon! 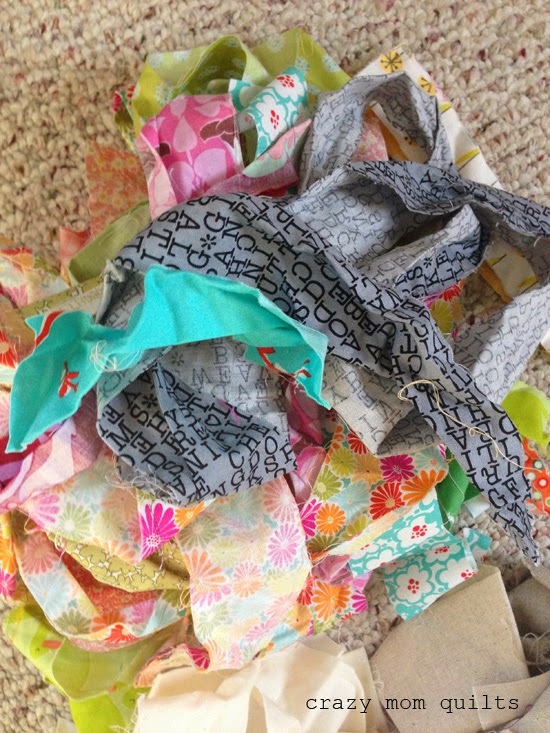 sorting scraps--where do I start? 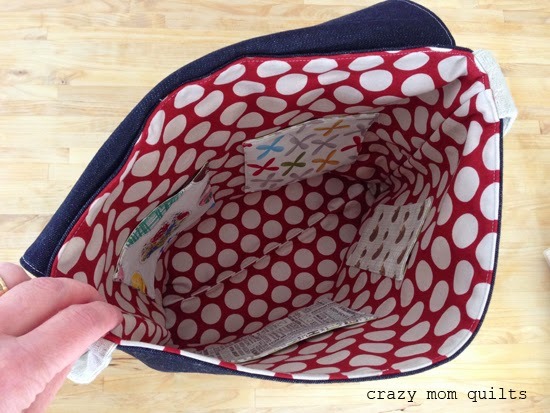 Suppose you have a good friend that passes along a bag of scraps to you. 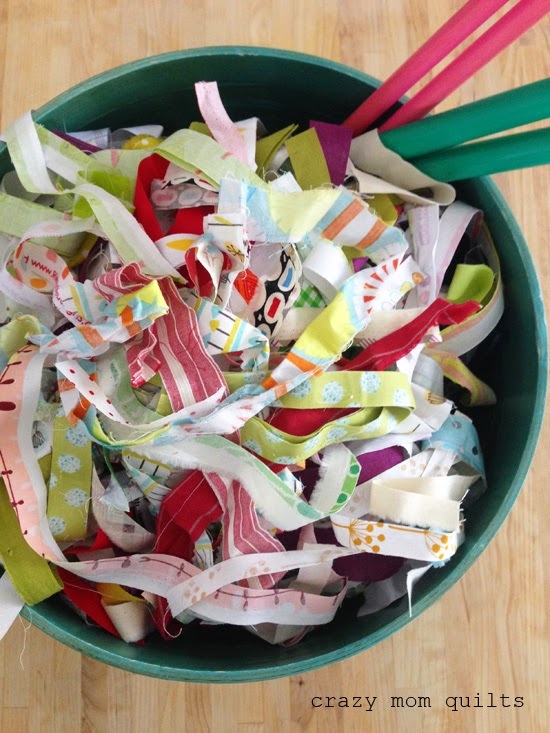 It can be exciting and wonderful, especially if you love scraps like I do. (They are my favorite!!!) But, it can also be a bit overwhelming. A lot of people ask, "where do you start?" I'm happy to tackle that question today. This is a bag of scraps that my friend Mary recently passed along to me. It's a garbage bag FULL of scrappy goodness! She was happy to have it out of her house. I was happy to bring it home. The first step is to dump it out onto the floor. 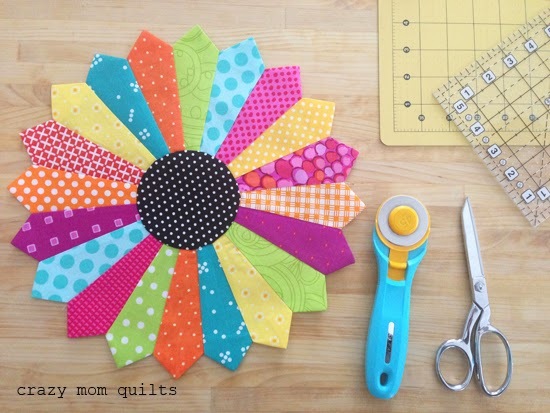 If you have a quilting buddy, it's nice to invite them to the party. For my initial sort, I asked my daughter to join me. We had a blast! She claimed a sizeable pile of her favorite fabrics and I look forward to making something special for her out of those scraps. She likes ALL of the novelty fabric! It's cute. -Donate pile-if it doesn't inspire you, pass it along to someone else. 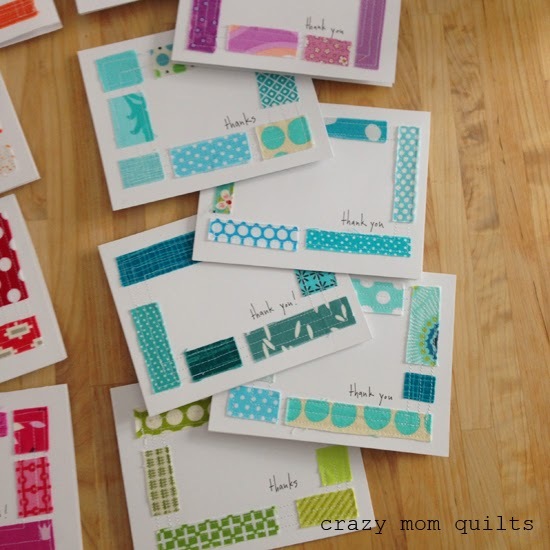 -Stacks of things that inspire you-Polka dots! Fun color combos that catch your eye. -Odd fabrics-laminated fabric, linen, canvas, etc. 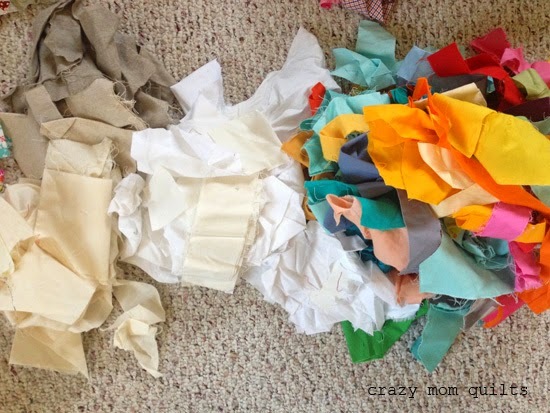 -Larger pieces of fabric that are a mainly one color-sort them by color. -Strings-long skinny strips 2 1/2" wide or less. You can make as many or as few piles as you wish when you are sorting. I usually have a LOT! This gets messy and it takes time, but be patient and have fun with it. If you get overwhelmed or if you run out of time, put away the pieces that you have sorted. Put the rest of the (unsorted) scraps back into the bag. It's ok! Sorting in stages is a good thing. It can keep that overwhelming feeling at bay. 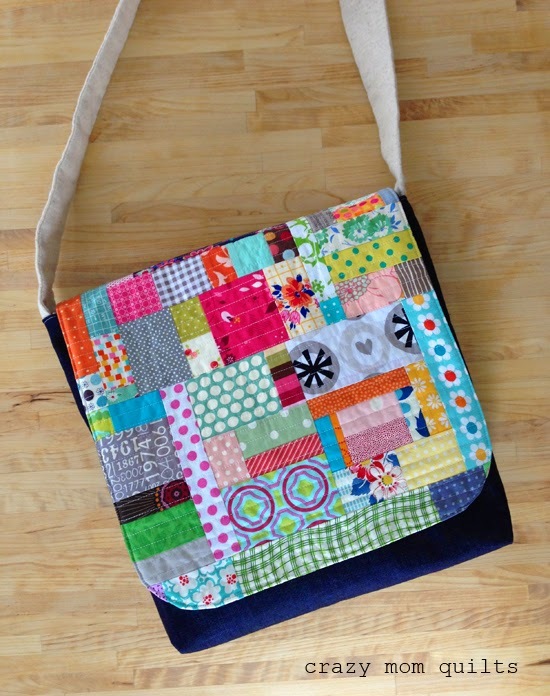 When I got this bag of scraps, I made a few zipper pouches using some laminated fabric and quilting cotton scraps. It was a nice project to dive into right away. I used up the laminated scraps, so I wouldn't have to find a place to store them. After that, I put most of the scraps back in the bag. I knew I would deal with them eventually. The have come in handy several times already. 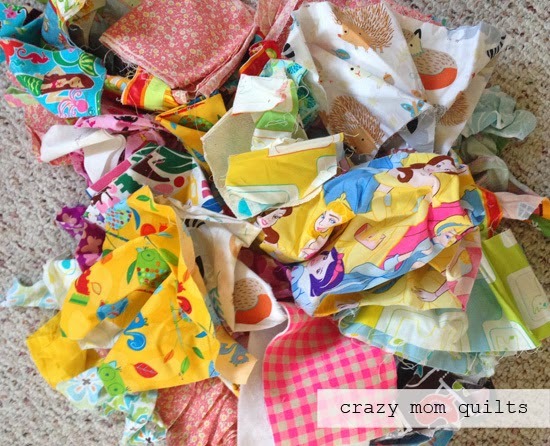 When I am working on a scrappy quilt, (like my pineapple quilt, for instance) I will get to a point where I feel stuck/feel limited by my fabric selection. That is the PERFECT time to go scrap diving in the big old bag of scraps. (Think of it as the equivalent of dumpster diving. Ha!) You never know what you will find, but most likely you will find something that will work. 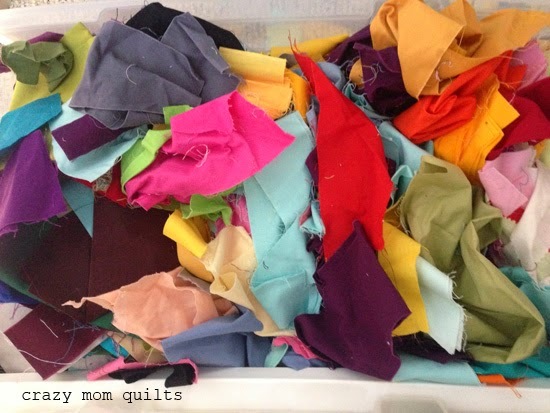 It's helpful to inject some variety into the quilt part of the way through. 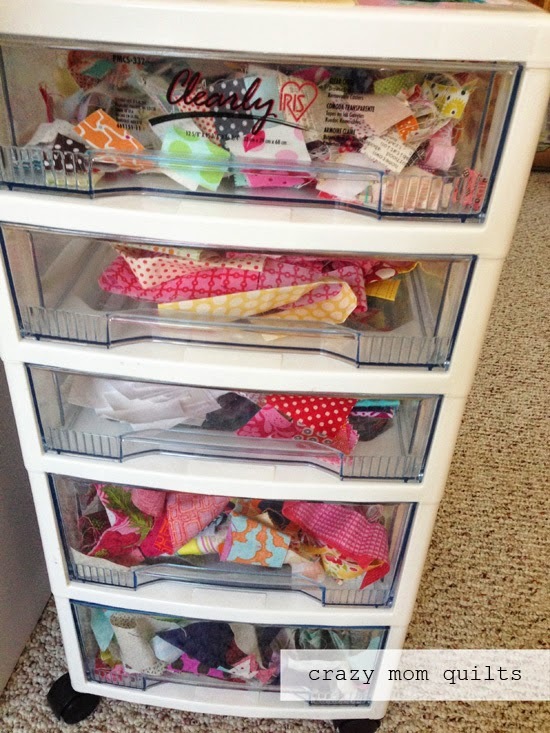 This isn't an all inclusive scrap sorting post, by any means, but hopefully it will motivate and encourage you to tackle your scraps! 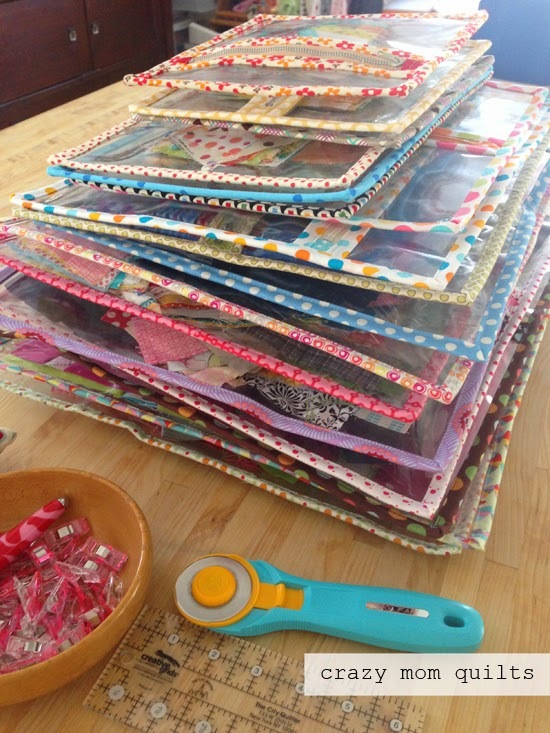 If you want more indepth information about scrap sorting and storing, there is an entire chapter devoted to it in Sunday Morning Quilts. If you have any questions about scrap sorting, I'd be happy to answer them in the comments.